A stunning set of documents about the financial links between Yasir Arafat and Rabbi Moshe Hirsch have been posted by the Intelligence and Terrorism Information Center at the Center for Special Studies (an Israeli organization). 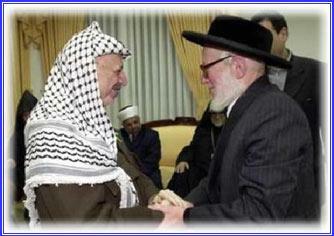 A meeting between Yasir Arafat and Moshe Hirsch in Ramallah, December 17, 2001. Among the hundreds of documents (captured from the Muqata during Operation Defensive Shield) dealing with money allotted by Arafat, two were found which related to large sums paid to Rabbi Hirsch for "expenses for activities." The payments in question, one after another, were unusually large ($25,000 on January 13, 2002, and $30,000 on February 14, 2002) and may indicate that Arafat paid him monthly. It should be noted that the amounts are significantly larger than those given to other cronies, which varied between a few hundred and a few thousand dollars. Neturei Karta members at the Holocaust-denial conference in Tehran. with their secular pompous approach behave in complete opposition to this philosophy and dare to say 'Never Again'. They have the audacity to think that they can prevent the A-lmighty from repeating a 'Holocaust'. This is heresy. … My friends I wish to end with the prayer that the underlying cause of strife and bloodshed in the Middle East, namely, the State known as 'Israel', be totally and peacefully dissolved. To be replaced by a regime fully in accordance with the aspirations of the Palestinians. 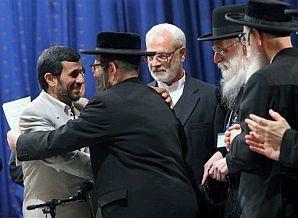 Neturei Karta members meet with Mahmoud Ahmadinejad. There is no question that there was a Holocaust and gas chambers. There are too many eyewitnesses. However, our approach is that when one suffers, the one who perpetrates the suffering is obviously guilty but he will never succeed if the victim did not deserve it in one way or another. We have to look within to improve and try to better ourselves and remove those characteristics or actions that may have been the cause of the success of the Holocaust. Other details: The five "rabbis" had their way paid by the Iranian foreign ministry and they had two meetings with Ahmadinejad. Jan. 28, 2014 update: Yitzhak Bergel, 46 and a member of Neturei Karta, has pleaded guilty to trying to spy for Iran against Israel. He was charged of contacting a foreign agent, intent to commit treason, and attempting to aid an enemy of Israel. The BBC recounts from the court ruling that in 2011 "Bergel flew to the German capital, Berlin, where he contacted the Iranian embassy and offered to collect intelligence about Israel. He then stayed in contact with Iranian diplomats after returning to Israel." A Jerusalem court has sentenced him to 4½ years in prison.